The Comets ISON and PanSTARRS in optical images taken by an astrophotographer, with insets showing the X-ray images from Chandra. April 18, 2016 – For millennia, people on Earth have watched comets in the sky. Many ancient cultures saw comets as the harbingers of doom, but today scientists know that comets are really frozen balls of dust, gas, and rock and may have been responsible for delivering water to planets like Earth billions of years ago. 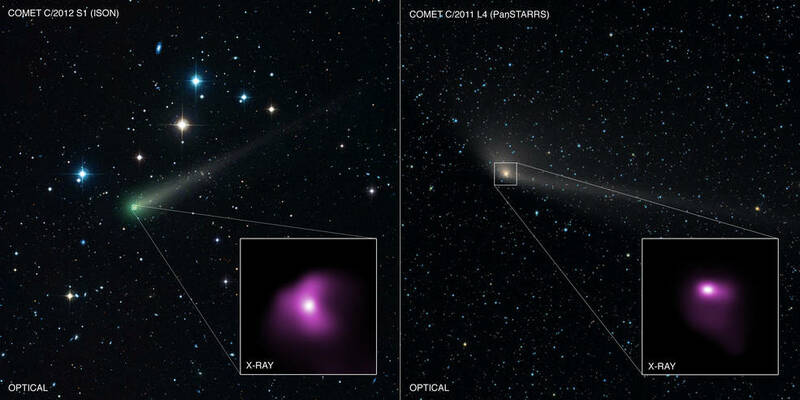 Recently, astronomers announced the results of a study using data collected with NASA’s Chandra X-ray Observatory of two comets — C/2012 S1 (also known as “Comet ISON”) and C/2011 S4 (“Comet PanSTARRS”). Chandra observed these two comets in 2013 when both were relatively close to Earth, about 90 million and 130 million miles for Comets ISON and PanSTARRS respectively. These comets arrived in the inner Solar System after a long journey from the Oort cloud, an enormous cloud of icy bodies that extends far beyond Pluto’s orbit. Scientists have determined that comets produce X-ray emission when particles in the solar wind strike the atmosphere of the comet. Although most of the particles in the solar wind are hydrogen and helium atoms, the observed X-ray emission is from “heavy” atoms (that is, elements heavier than hydrogen and helium, such as carbon and oxygen). These atoms, which have had most of their electrons stripped away, collide with neutral atoms in the comet’s atmosphere. In a process called “charge exchange,” an electron is exchanged between one of these neutral atoms, usually hydrogen, and a heavy atom in the solar wind. After such a collision, an X-ray is emitted as the captured electron moves into a tighter orbit. The Chandra data allowed scientists to estimate the amount of carbon and nitrogen in the solar wind, finding values that agree with those derived independently using other instruments such as NASA’s Advanced Composition Explorer (ACE). New measurements of the amount of neon in the solar wind were also obtained. A paper describing these results appeared in February 20th, 2016 issue of The Astrophysical Journal and is available online. The authors are Bradford Snios and Vasili Kharchenko (University of Connecticut), Carey Lisse (Johns Hopkins University), Scott Wolk (Harvard-Smithsonian Center for Astrophysics), Konrad Dennerl (Max Planck Institute for Extraterrestrial Physics) and Michael Combi (University of Michigan).